While in the US is commonly used to call gold laminated finishes "Gold Rolled" (or "Gold Filled" o "Rolled Gold Plate"), in the European production is commonly used the abbreviation KR, short for "Karat Rolled" that usually indicates the titling of gold laminations are often found for overlays. Before the abbreviation there is the title of gold percentage present in the rolling, expressed in carats, therefore the sign "18 KR" indicates a 18 carat gold lamination, while the sign "14 KR" a 14 carat gold lamination. In Italy the abbreviation was later translated, in the wake of the Italianisation campaign led by the fascist regime, as "Karati Rinforzati" to keep the acronym (a partial translation, because "Karati" is not Italian). Today it would simply indicated as goldplated. The "KR" letters often draws people in confusion because they are taken as titration for the coating material, which is not gold. 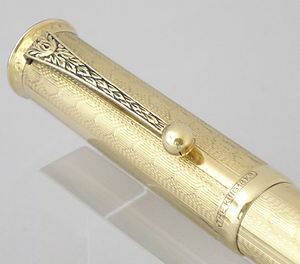 A solid gold material (nib or overlay) has to be stamped by the correct acronym, using an expression in carats (today, and in less old pens, it would be stamped with a millesimal percentage). So a solid gold materal would be indicated, depending on the country, or with the "K" only, or the "C" only (as "18 K" or "18 C") or by the letters "Kt" or "Ct" (as "14 Kt" or "14 Ct"). Sometimes, in Italian pens, the same is marked also with "Ki". This page was last edited on 16 December 2018, at 17:01.